One of the largest feral cats we have seen in a long time. The feral cat population across Arnhem Land in the Northern Territory has exploded, with traditional owners saying they've noticed a steep decline in local birds and other wildlife. The Warddeken ranger group has taken some amazing pictures of how big the feral cats are getting in the region, and has used them to leverage funding from the Federal Government to monitor and kill the pests. 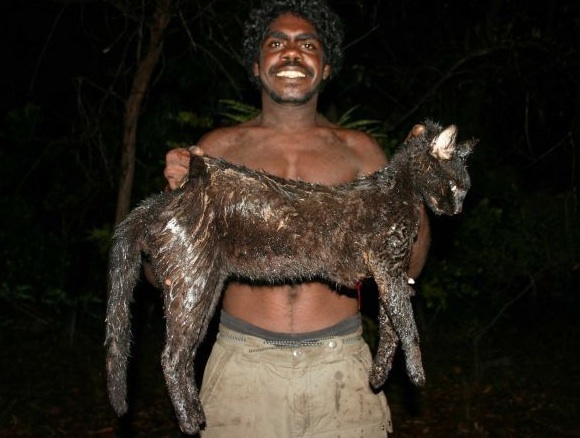 Chairman of the ranger group, Dean Yirbarbuk, says the cats are getting bigger and there are "several thousand" of them in the Warddeken area of central Arnhem Land. "All we know is our birds and animals are declining," he says. "We hope this project will help us to try and find a way to get rid of the cats." Research manager Georgia Vallance says funding from the National Environmental Research Program will complement the ranger groups' culling activities. "We've been noticing more feral cats here over the last few years, and when these cats are culled by the rangers they perform a gut analysis, and the amount of animals inside these cats is staggering. "So the project the rangers are now doing is to try and establish the population of cats, what their range is and what their behaviour is. "There's been some research that cats will gravitate towards recently burnt country because the hunting is easier, and if that's the case we'll have to adapt our management regime." Ms Vallance says funding is being spent on tracking cats using motion-sensor cameras. Later in the year, the Australian Wildlife Conservancy will provide dogs specially trained to catch cats, so that GPS collars can be attached.